Health Care Workers (HCW) face a very wide range of occupational hazards to health. This applies to those who work in hospitals, in general practices or in the community within the National Health Service (NHS), or to their counterparts in private employment. The category may also be extended to include others such as workers in the pharmacutical industry. This page can only begin to address some of them. It is still patchy and much more needs to be added. The highest occupational risk for many HCW consists of musculoskeletal injury (commonly manifest as back pain) usually caused by moving and handling. Othe physical hazards may include noise in boiler houses, and ionising radiation in various diagnostic and therapeutic contexts. The image on the right shows a radiographer in a general hospital. 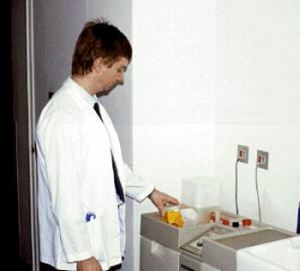 The processing of X-ray films may be associated with the release of various respiratory irritants, such as sulphur dioxide, glutaraldehyde, and acetic acid. Some of these agents may cause occupational asthma. By using sealed bottles of photographic reagents and introducing them into the processor using a closed system, as shown in the image, exposure can be considerably reduced. Inadequately controlled glutaraldehyde exposure in the health service, notably in the cleaning of endoscopes, such as in bronchoscopy and gastroscopy, has been responsible for serious ill-health in some nurses, and other health care workers. 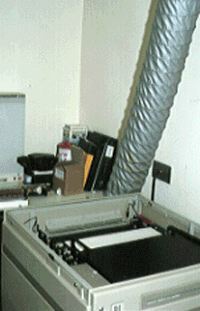 Formaldehyde is another aldehyde implicated in the causation of occupational asthma. Other important sensitisers in the health care setting include latex. Latex protein can result in severe Type I sensitisation manifest by angio-oedema, occupational asthma and urticaria. Chemical irritants, corrosives and poisons range from cleaning agents, to cytotoxics and other pharmaceuticals. HCW can be exposed to various biological hazards, mostly of an infective nature ranging from tuberculosis through to blood borne pathogens, such as Hepatitis B and HIV. A list of the author's publications on the subject will be added here in due course.